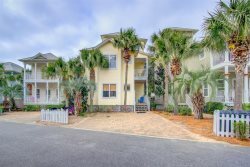 Luxury 30A Seacrest Beach Vacation Rental! This private beach front 3-bedroom corner condo, boasts stunning panoramic views of the Gulf of Mexico. The lovely entry hall leads you into the open living area, kitchen, and dining that overlook the Gulf. The master suite is located off the living area and allows for views of the Gulf from the king-sized bed. The master suite includes a dressing area, walk-in closet, double vanity, soaking tub, walk-in shower, toilet, and flat screen TV. Bedroom 2 is located off the entry hall and has a King bed, private bath with tub/shower combo, and flat screen TV. Bedroom 3 has two-queen beds, a flat screen TV and bath. This ground floor unit allows for easy beach access directly out the gulf front doors. 4) 3 Bikes are complementary with the property. Waiver must be on file prior to access being granted. Dillon and Cassi were awesome to work with. They jumped on any questions and were very knowledgable. The property was beautiful and had everything you need for a relaxing get away. Steps from the beach, a stunning view and a very quiet property to enjoy! we thoroughly enjoy staying at the Villas at Sunset Beach and February is the perfect time to go--not too crowded--the condo is roomy and comfortable--the fireplace is excellent and you can't beat the view--love, love, love it!! Great condo and good beds Big windows with lots of light.